Thyroid disease is common in the general population (6.6%), and the prevalence increases with age. Screening for thyroid dysfunction is indicated in certain high-risk groups, such as neonates, elderly and diabetics (36%). It is more common in Type1 diabetics as compared to Type2. As T1DM is an autoimmune disorder and is thus frequently associated with other autoimmune disorders including autoimmune thyroid disorders. Autoimmune thyroid disorders may cause the thyroid to fail (Hashimoto’s thyroiditis), and leads to hypothyroidism or sometimes to become overactive (Graves’ disease), and leads to hyperthyroidism. Both Hashimoto’s and Graves’ will have positive blood tests for thyroid antibodies. Hypothyroidism is far more common than hyperthyroidism, and can occur in both T2DM and T1DM. The symptoms develop slowly and include fatigue, dry/coarse skin & hair, cold intolence, weight gain, hoarse voice and heavy or irregular menstrual periods. 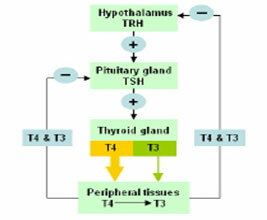 Blood levels of thyroid hormones (Free T3, Free T4) are low and levels of TSH are typically high. Blood glucose control is generally not changed, but blood cholesterol is high. 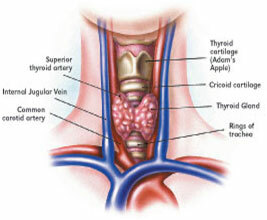 Thyroid failure secondary to radioactive iodine therapy or thyroid surgery is also common. Rarely, pituitary or hypothalamic disorders can result in secondary hypothyroidism. L-Thyroxine (Eltroxin, Thyrox or Thyronorm) is the most recommended treatment. Hyperthyroidism is much less common, with a female-to-male ratio of 9:1. Graves' disease is the most common cause and affects primarily young adults. Toxic multi-nodular goiters tend to affect the older age-groups. Symptoms of Hyperthyroidism develop over a short period of time. Symptoms include palpitations, tremors, insomnia, anxiety/ agitation, sweating, heat intolerance, weight loss, hair loss, and scant or absent menses. In older patients (>70 years of age), the typical symptoms may be absent. Blood levels of thyroid hormone are elevated and levels of TSH are depressed. The blood glucose levels also become high. In patients with Graves’ disease, the thyroid gland may become enlarged ("goiter"). There may be swelling of the muscles and tissues around the eyes, causing the eyes to bulge forward (“exophthalmos”). Q. How Thyroid Dysfunction affects Diabetic patients? The presence of thyroid dysfunction may affect diabetes control. Hyperthyroidismis typically associated with worsening glycemic control and increased insulin requirements. There is underlying increased hepatic gluconeogenesis, rapid gastrointestinal glucose absorption and probably increased insulin resistance. 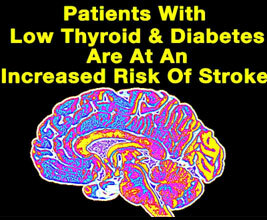 Indeed, thyrotoxicosis may unmask latent diabetes. In practice, there are several implications for patients with both diabetes and hyperthyroidism. First, in hyperthyroid patients, the diagnosis of glucose intolerance needs to be considered cautiously, since the hyperglycemia may improve with treatment of thyrotoxicosis. Second, underlying hyperthyroidism should be considered in diabetic patients with unexplained worsening hyperglycemia. Third, in diabetic patients with hyperthyroidism, physicians need to anticipate possible deterioration in glycemic control and adjust treatment accordingly. Restoration of euthyroidism will lower blood glucose level.The presence of hypoglycemia is uncommon in isolated thyroid hormone deficiency and should raise the possibility of hypopituitarism in a hypothyroid patient. More importantly, hypothyroidism is accompanied by a variety of abnormalities in plasma lipid metabolism, including elevated triglycerides and LDL cholesterol levels. Even subclinical hypothyroidism can exacerbate the coexisting dyslipidemia commonly found in type 2 diabetes and further increase the risk of cardiovascular diseases. Adequate thyroxine replacement will reverse the lipid abnormalities. Subclinical hypothyroidism can elevate serum LDL cholesterol and worsen pre-existing dyslipidemia, further increasing the risk of atherosclerosis. Subclinical hyperthyroidism may increase the risk of cardiac arrhythmias and exacerbate angina. Since diabetic patients are at high risk for cardiovascular diseases, the diagnosis and treatment of subclinical thyroid diseases is important. What is the association between type 1 diabetes and thyroid disorder? In young women with type 1 diabetes, there is a high incidence of autoimmune thyroid disorders. Transient thyroid dysfunction is common in the postpartum period and warrants routine screening with serum TSH 6-¬8 weeks after delivery. Glucose control may fluctuate during the transient hyperthyroidism followed by hypothyroidism typical of the postpartum thyroiditis. It is important to monitor thyroid function tests in these women since approximately 30% will not recover from the hypothyroid phase and will require thyroxine replacement. Recurrent thyroiditis with subsequent pregnancies is common. 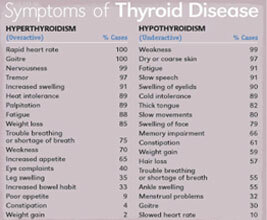 How to diagnose Thyroid Dysfunction? The diagnosis of thyroid dysfunction in diabetic patients based solely on clinical manifestations can be difficult. Poor glycemic control can produce features similar to hyperthyroidism, such as weight loss despite increased appetite and fatigue. On the other hand, severe diabetic nephropathy can be mistaken for hypothyroidism because patients with this condition may have edema, fatigue, pallor, and weight gain. Even poorly controlled diabetes may produce changes in thyroid function tests that occur in nonthyroidal illnesses. Typical changes include a low serum T3 due to impaired extrathyroidal T4-to-T3 conversion, a low serum T4 due to decreased protein binding, and an inappropriately low serum TSH concentration. The presence of anti-thyroid peroxidase (TPO) antibodies is helpful in predicting the development of autoimmune thyroid disorders, especially hypothyroidism. Patients who have anti-TPO antibodies should be screened for thyroid dysfunction on a regular basis, so early detection and treatment is possible. What is the importance of highly sensitive TSH (hsTSH)? The availability of the highly sensitive immunoassay for serum TSH (with detection limit of <0.1 mU/l) provides a major advance in the diagnosis of thyroid disorders. It is the most reliable and sensitive screening test for thyroid dysfunction and allows both hypothyroidism and hyperthyroidism to be diagnosed with certainty. Subclinical thyroid dysfunction can only be diagnosed by an abnormal hsTSH because the serum T3 and T4 are normal and patients are asymptomatic. How to Manage Thyroid Dysfunction? Frank hypothyroidism should be treated with thyroid hormone therapy. L-thyroxine is the most widely used thyroid hormone replacement. Natural thyroid extracts such as desiccated thyroid should no longer be used.The usual full replacement dose is 1.6 µg of L-thyroxine/kgbw/d. Often, patients with mild thyroid failure require less than a full replacement dose initially. The dose can be adjusted by measuring TSH every ¬2-3 months.Once the TSH is normalized and the patient is established on a stable dose of L-thyroxine, TSH monitoring can be done annually. With progression to complete thyroid failure, there is usually a need to increase the thyroxine dose with time. In diabetic patients with underlying coronary artery disease, L-thyroxine therapy may exacerbate angina by increasing myocardial contractility and heart rate. Therefore, it is best to start with a low dose (i.e. 25 µg daily), and increase slowly by monthly increments of 25 µg while monitoring the patient's clinical status and serum TSH levels. Because hyperthyroidism can cause serious adverse effects on glycemic control and possibly worsen pre-existing coronary artery disease, it is desirable to consider definitive treatment with radioactive iodine therapy whenever possible. There is no contraindication to the use of antithyroid medications in diabetic patients, but the long-term remission rate of Graves' disease is <40%. Patients with toxic multi-nodular goiters or an autonomously functioning thyroid nodule should be definitively treated by radioactive iodine or surgery. When to treat subclinical hypothyroidism? Treatment of subclinical hypothyroidism should be considered if 1) patients have elevated serum LDL cholesterol that is worsened by the hypothyroidism, 2) they have detectable serum anti-TPO antibodies, because the progression to frank hypothyroidism is high in this group, or 3) they are symptomatic. Regular screening for thyroid abnormalities in all diabetic patients. Highly sensitive TSH (hsTSH) is the screening test of choice. In T1DM patients always determine anti-TPO antibodies, and if present, then annual TSH screening is warranted. Otherwise, a TSH assay should be done every 2¬-3 years. In T2DM patients, a TSH assay should be done at diagnosis and then every 5 years. In hyperthyroidism there may be worsening of glycemic control and increased insulin requirment.